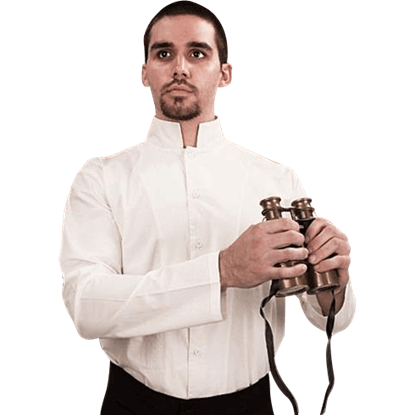 The perfect piece of apparel to complete your steampunk outfit, the Black Airship Shirt is versatile in its design, lending itself well to use in achieving the appearance of an airship captain or of a western gentleman. 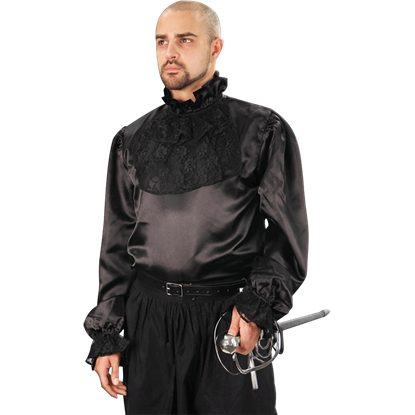 For a look that is debonair and dramatic, this black shirt makes a fantastic addition to period ensembles. The Black Satin and Lace Jabot Shirt feels smooth against your skin while helping to create an unforgettable outfit. The sophisticated style evident in this shirt offers its wearer a great look for standing out at any formal gathering. 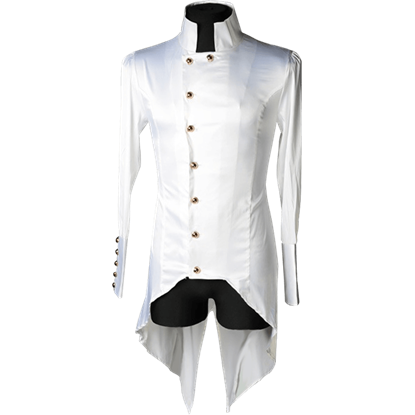 The Cream Steampunk Officer Shirt includes a buttoned side extension as a dramatic flourish to this piece. 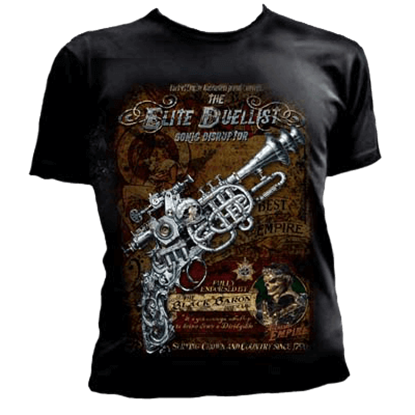 The Elite Duellist Men's Fitted T-Shirt is made in the gothic style. It features a steampunk piece of equipment with the Black Baron in the bottom left corner. This t-shirt is made from 100% cotton and is printed in full color. 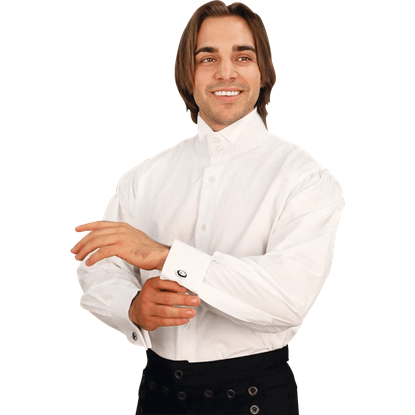 A magnificent piece of formal wear for the Victorian gentleman to radiate his love of classic 19th century styling, the Formal White Victorian Shirt features a winged collar design and an eye-catching pintex yoke. Formal attire should make you look your absolute best, and this shirt certainly strives to do that. 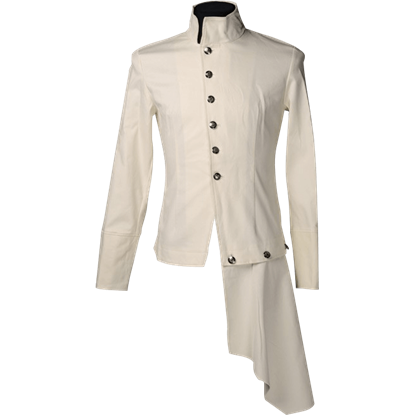 The Gothic White Satin Regal Tailcoat Shirt rises to a high collar and buttons down the right side of the front in shimmery satin. The Victorian gentleman was a true fashion plate. Now you can adopt that iconic look with the High Society Shirt, which will become a favorite of your wardrobe. This formal shirt can be easily accessorized with a cravat or necktie. Steampunk fashion offers a charming twist on the usual Victorian or science fiction attire. 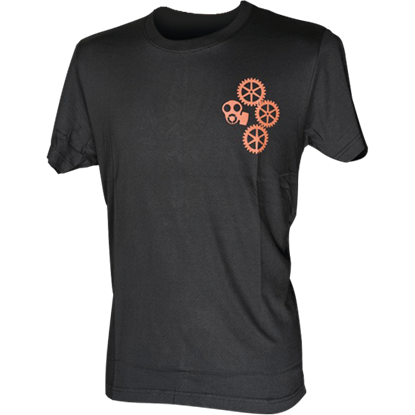 The Mens Steampunk Gears T-Shirt displays a steampunk-themed gear design over the left side of the chest of this comfortable piece. This formal shirt looks sharp under a vest and suit coat when you are aiming for an authentic period appearance. The Nehru Collar Empire Shirt displays an off-white color in a cotton blend that feels as great as it looks. An exceptional shirt for helping you achieve your Old West steampunk identity, the Off-White Side-Button Steampunk Shirt features a unique and eye-catching asymmetrical design with a side-button closure on its front. 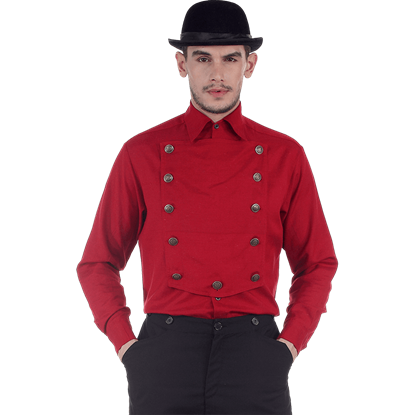 Featuring an eye-catching steampunk styling, the Red Airship Shirt is a magnificent way for you to assume the role of an airship captain or simply display your enjoyment of the elegant allure of the steampunk genre. 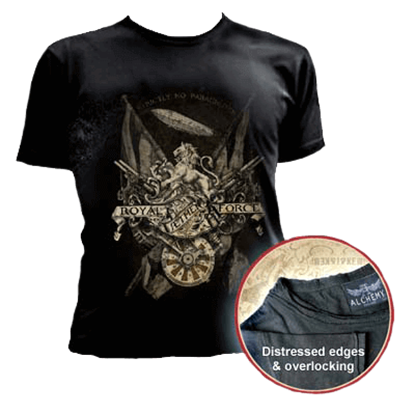 The Royal Aether Forces Fitted T-Shirt proudly depicts the crest of the Victorian fly boys, the early and secret forerunners of the famous Royal Flying Corps. This t-shirt has a fitted form and is made from 100% cotton fabric.